It was a painful irony – some might call it a cruel irony – one noted to my congregation: On a Sunday so close to Christmas, when the Catholic Church admonishes her children in the words of the opening antiphon Gaudete (Rejoice! ), we found ourselves just a few short days past the horrific and inexplicable violence which occurred in Newtown, Connecticut. How can we speak of joy with the knowledge that the lovingly wrapped gifts for those 20 children, all of them six or seven years of age, would remain unopened under the brightly decorated trees in their families’ homes? For some, this may have been the final brutal weight which saps one’s soul of any joy – or hope. Many are in despair in the face of such insane evil. If by “sense” we mean how do we figure it all out? How do we examine the parts of the thing? How do we understand the whys and wherefores, the preconditions, the early warning signs, and all the other factors that went into what happened in that school? If that is what we think we are looking for, then, no – there is no sense, no meaning, even if we had the plausible explanation that good people so desperately want. Evil is never rational; it is disordered, unreasonable and, ultimately, unreal. It is fundamentally parasitic on the Good. When we ask our bewildered why? – we are not looking for data points. Even less should we offer glib responses in the face of this shattering loss – this modern-day slaughter of the innocents. We are, instead, seeking the meaning in the face of this mysterium iniquitatis. The meaning we seek is not so much the significance of evil as the meaning, the value and the dignity of those young lives, of our lives – indeed of life itself. And it is precisely here that the words of the Gaudete, have their effect – if we take the time to ponder what it means. The ultimate response to the evil made manifest at Newtown, or at the shopping mall in Portland, or at Columbine, or in the abortuaries, or in the concentration camps, or anywhere that evil holds sway over humanity at any time and in any place whether exposed or hidden going all the way back to the beginning of time – is the love made manifest precisely in the midst of so broken and dented a world where such things are conceivable. Certainly this takes us to the core of what Christmas means: God’s concrete gift from heaven for the redemption of humanity from the effects of sin in the person of his Son. It is as if that transcendent meaning has permeated the whole of the season’s recollection. Even once the magi from the East arrive (reminding us of the universality of the Gift) they themselves bring sumptuous gifts to the Infant-King. And so the popular Christmas narrative continues, to the point that the pictorial aspect of the narrative can overwhelm at times the meaning. The delicate thing about a gift – a real gift – is that is can only be given in freedom. Indeed it is impossible without freedom. A true gift cannot be psychologically manipulated or physically coerced out of anyone and remain a gift. What is at work here at some level is love, but it is always fragile in that the gift must be given freely and received freely. Here is where one may find the seed of an entire civilization of love in this kind of gratuitousness which results in a firmer and nobler foundation than the capacity of any politician or army could muster. The manifestation of that incarnate love in Bethlehem subsumes into Himself all the pain and loss, grief and tears of every father and mother who has ever wept for the loss of a child – the tears of all humankind. The act of the Eternal God’s condescension in Jesus Christ is His answer to the mystery of evil with the mystery of infinite love, a love so powerful that it takes an eternity until every trace of evil and suffering and pain and mourning, shall be fully and finally obliterated. In the end He will prevail. “Love never fails” (1 Cor. 13:8). This is why, even through the tears as you hold your children a little tighter this Christmas, we can hear the call to rejoice at its deepest level of meaning. This article, which originally appeared on Forbes.com, was adapted from a homily delivered at Sacred Heart of Jesus Parish in Grand Rapids, Mich., on Dec. 16. The Michigan legislature passed right-to-work legislation today, a landmark event that promises to accelerate the state’s rebound from the near-collapse it suffered in the deep recession of 2008. The bills are now headed to Gov. Rick Snyder’s desk. The right-to-work passage was a stunning reversal in a very blue state -- the home of the United Auto Workers union. Following setbacks for organized labor in Wisconsin last year, the unions next turned to Michigan in an attempt to enshrine prerogatives for their organizing efforts in the state constitution. A union-backed ballot proposal was handily defeated by voters in the Nov. 6 election. At the core of Christianity, Judaism, Islam and all great religions are the values of dignity and respect, values from which economic justice and the right to organize can never be separated. Gov. Rick Snyder’s Presbyterian tradition “affirms the rights of labor organization and collective bargaining as minimum demands of justice.” Similar statements have been made by the United Methodist Church, the United Church of Christ, the Union for Reform Judaism and the Evangelical Lutheran Church in America, to name but a few. However, we do not need statements from on high to understand what we know to be true on the ground. Right-to-work laws do not help the least among us. Rather, they profit those who already hold more power and wealth than is their fair share. They foster extreme inequality, inequality that can only lead to extreme disparities and extreme division. Just as Catholic bishops united in 1986 to speak against organized efforts to break unions, it is now time for Michigan citizens of all faiths to unite against an unjust law, passed in great haste, which will do great damage to our state. Each of us must take responsibility for speaking out and taking action to prevent a terrible injustice from occurring in Michigan. Historically, the Catholic Church has looked favorably on unions -- with exceptions, of course. The Church sees unions as one way to look after the well-being of workers and their families. However, this favorable bias does not mean that workers are obligated to join a union, nor that management is obligated to accept the terms of a union. The right to join a union, in Church social teaching, is rooted in the natural right of association, which of course also means that people have the right not to associate. Which is exactly what this legislation addresses; it protects workers from being coerced to association with and paying fees to a group with whom they would rather not join. Pope Leo XIII addressed the intolerable treatment of workers during the Industrial Revolution in Rerum Novarum. As I have observed earlier on this blog, the “savage capitalism” that occurred several decades ago is not what workers in Michigan face today. The entire thrust of Leo’s encyclical, beginning with its title, was precisely aimed at looking around at the “new things” (Rerum Novarum) that were emerging in his day, and reflecting upon them in the light of Scripture, Tradition and the Natural Law. If the situation for Michigan workers is remotely comparable to the subsistence living conditions under which many workers lived in the latter part of the 19th century, this has somehow escaped my notice. That, to my mind, is also a good working definition of economic justice, one we can embrace without reservation. 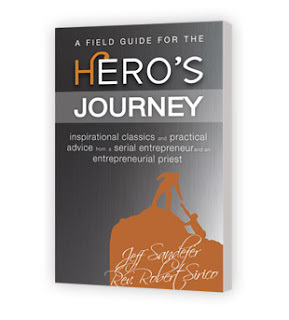 I've written a new book with Jeff Sandefer, an entrepreneur and founder of Acton Academy, entitled A Field Guide for the Hero's Journey. The description is below. You can find out more by visiting the official website for the book. Do you feel trapped, bored, stuck in a meaningless routine? It may be you think you’re too ordinary to ever do something special. Perhaps you’re afraid that if you try, you’ll fail. The startling truth is this: Just about anyone can do great things, can live a life that’s remarkable, purposeful, excellent, and yes, even heroic. If you want to be a hero, you can be. Will you choose to do it? Will you decide to journey heroically, instead of spending your life merely marking time? If so, this is the book for you. Welcome to your heroic journey. "Hero's Journey should be required reading for all young people entering the business world who dream of being entrepreneurs and are seeking inspiration." "Many 'new ideas' in today's leadership writing are recycled from timeless exemplars in literature, philosophy and sacred texts. Hero's Journey draws upon those texts but wraps them in poignantly personal lessons from a world class entrepreneur and a worldly statesman priest." "A Field Guide for the Hero's Journey" is an amazing book. Inspirational and practical at the same time and guaranteed to address virtually any "do I have what it takes?" questions you may have about a life of entrepreneurship. Jeff Sandefer is the educator better suited than anyone on earth to give lie to the adage, "Those who can, do. Those who cannot, teach." He's been there, done it (incredibly well), and now teaches with a caring and compassion I have experienced in few other successes. Jeff Sandefer and Rev. Robert Sirico have national reputations as extraordinary teachers who change the lives of their students forever. Guided by the premise that everyone has the potential to be a hero, this inspirational and practical book will help you focus on the right questions that will enable you to lead a life of purpose, achievement, and, yes, heroism.